Wow, 2018 went by in a blur! I wasn’t going to do a year in review but I figured – why not? It could be fun to look back in a couple years at how I spent the last year of my 20s. I am slightly panicking at the fact that I will be 3-0 next year. I’ve always thought of the 30s as old and I’m curious what the 30s will bring. I’m not ready to be old haha! I started the year blissfully at home. After an exhausting 2017 where I said ‘yes’ to every opportunity, it was really nice to recharge and spend some quiet time in the city. I honestly can’t really remember what I did… except I remember I got really obsessed with the idea of bullet journaling, ordered a gazillion bujo supplies… and then abandoned the idea just as fast. I worked with Puerto Rico tourism and Travelocity to bring awareness to the beautiful Caribbean island and showcase how it was ready and willing for tourism! That was a great trip! By the end of the month, I went to 2 conferences, both of which were fun, and slowly eased back into work mode. By the beginning of February, I was over being home and itching to travel. So, we started booking projects and personal trips for spring + summer and continued to plug away at work, work, work. As one does as a solopreneur – all I think about and want to do is work! February was also Fashion Week in New York, which was fun! Another highlight was getting a chemical peel for the first time. I did 2 treatments in total, spaced out over a couple months, and am thinking of getting it done again. Also discovered PCA skincare this month which was life changing. Hm, maybe I should write some more beauty posts? In March, we took a trip to Boston to revisit one of C’s favorite cities. 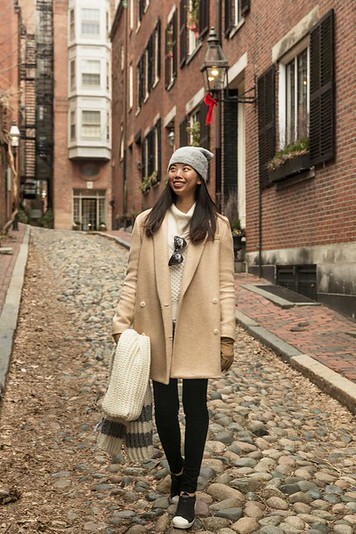 It was my first time in Boston and while I loved the food scene, I couldn’t really get into it because it was freezing cold and… I packed poorly. Story of my life – I am the worst packer – which is why I always laugh when you guys always want me to write more packing guides. Although I guess, because I am such a bad packer it helps me to look back on a trip and write a thoroughly comprehensive packing guide? Anyway, I would love to re-visit Boston in the summer! I can’t really remember anything that happened in April. Oops. Good thing I got lots of rest in April, because May was busy! I went to Puerto Vallarta, Mexico for a week long project. I love visiting Mexico and sometimes it’s fun to hotel hop and enjoy the all-inclusive lifestyle. I mean, who doesn’t like room service, spa treatments and sunshine? Then, I flew back to New York, unpacked and re-packed for Nepal. I don’t count countries (although maybe I should because I don’t know how many I’ve been to) but Nepal was a new one for me! I originally was planning to travel all over the country, but the trip was booked pretty last minute, so in the end I only saw Kathmandu and Pokhara. It was still really fun! I met a bunch of bloggers, content creators and travel agents which is always nice, since blogging is a pretty solitary day-to-day. Nepal is a bit chaotic and dusty but definitely an adventure to explore. To be honest, I had some mixed thoughts and am not sure if I would revisit… which is why I’ve only written 1 blog post about it. I am planning to write a couple more posts in 2019 though, as the Nepalese people are lovely and they deserve more tourism. Also, we got a Trader Joes in my neighborhood! Younger me would cringe at the fact that I am now excited by grocery stores but I love cooking now and ah, the convenience of this store is unbeatable. And their dark chocolate peanut butter cups are addicting. Another I-don’t-remember-much month because I don’t have many photos… Most likely spent it enjoying NYC in summer (my favorite season) and worked a lot. July was fun! I went to my third conference of the year, had a great time, and also visited Nantucket for the first time! Ah, forget the Hamptons (over-rated), I want to summer in Nantucket every year! The only downside is how difficult it can be to get there. I learned the meaning of the Grey Lady on that trip. Read more: Visiting Nantucket, New England’s Most Charming Escape! Is it really summer if you don’t take a road trip? C and I packed some duffel bags and piled into a swoon worthy Volvo for our first road trip together. He did all the driving, I did all the navigation and we made it to the northern most state in one piece! Maine was a mix of work and personal travel. We really enjoyed the road trip and discovering some adorable small towns throughout New England. We also tried sailing for the first time, on a classic Maine windjammer! We both realized we’re not cut out for the sailing lifestyle and gratefully put our sea legs back into our cushy Volvo rental to drive home. When we came home, we found that ants had moved right in. Ew. That little infestation took a full week to take care of and in the meantime, we hopped over to Brooklyn for a little NYC staycation. The staycation had been set up weeks beforehand and I was dying to leave the disgusting apartment but also petrified because well, basically every hour I would revisit the wall / window area where the ants were coming from and kill like 200-300. By killing them every hour, the queen bee seemed to know and would stop sending out worker bees. But then overnight, I would wake up to hundreds because obviously I’d been sleeping and not vigilant. So yeah, when we returned from the short staycation (1.5 days), the ant hoard was fully moved in. I’m talking under carpets, made it to my laundry machines, like full on disgusting. I lost it at that point and eventually got things worked out with the building for the exterminator to come. I’ve been living in New York for pretty much my entire adult life but 2018 is the first year I really got a sense of the good & bad of living in the Big Apple. I think nearly every industry has a surge in September. Summer vacation is over, kids are back in school and everyone suddenly finds motivation to hustle until the end of year. We kicked off the month with Fashion Week, went to our 4th conference of the year and dived right into a project in Upstate New York. The Finger Lakes were fun, but to be honest, we didn’t explore as much as we should have, with the conference going on. Afterwards, we went to the Adirondacks where I tried outdoorsy things for the first time in a long time. I came to the conclusion that I hate hiking. I’m always up to try it but I’m just going to be honest – it’s not my idea of fun. I also tried salmon fishing for the first time! How funny is that picture lol? That was SO much fun, and a great arm workout, but a little sad, because we didn’t actually eat the salmon. Unfortunately I think the fish died even though I threw him back… so next time I fish I want to actually eat it! I also need to lift some weights because part of the reason that poor fish died is because it took me too long to reel him in. I think watching a sport fishing competition would be really fun. Then we ended the trip in the 1000 Islands, which is where I was hoping we would spend most of our time. I loved it! Boldt Castle is unique and beautiful and I was so sad we didn’t see some of the other cool castles in the area. We also stayed at this cute hotel run by a retired school teacher. She was so excited to host the press trip and put so much thought and effort into the hotel renovation. I think it’d be fun to run a b&b or hotel! Once I made it back to the city (which is another story…), I re-packed for more adventure. This time, I went down south to Guyana, another new-to-me country! Wow, looking back, this was one of my favorite trips of the year. It’s funny because during the trip, I was realllyyyy uncomfortable. We were camping outdoors, sleeping in hammocks, piranha fishing, learning archery… all very fun, but in the most humid conditions and while wearing covered clothing, from head to toe. From frogs hopping out of shower drains to tarantulas saying hello at turn down service, it was exciting to say the least. Oh, and a bird pooped on my bed not once, but 3 times before we chased him out. A great group of people made the entire experience unforgettable! I also visited the Hudson Valley again. Before, I went with friends and did a wine/food binge across Beacon and.. to be honest, I can’t remember where else! For this trip, we did a combination of historic castles/homes and foodie spots in Dutchess county. Then C and I packed for an epic adventure even further south. I introduced him to Buenos Aires for the first time and we stuffed ourselves with steak and wine. Also, the cocktail scene here is fantastic! From BA, we flew to Trelew to cross off a huge bucket list item…. an antarctic cruise! 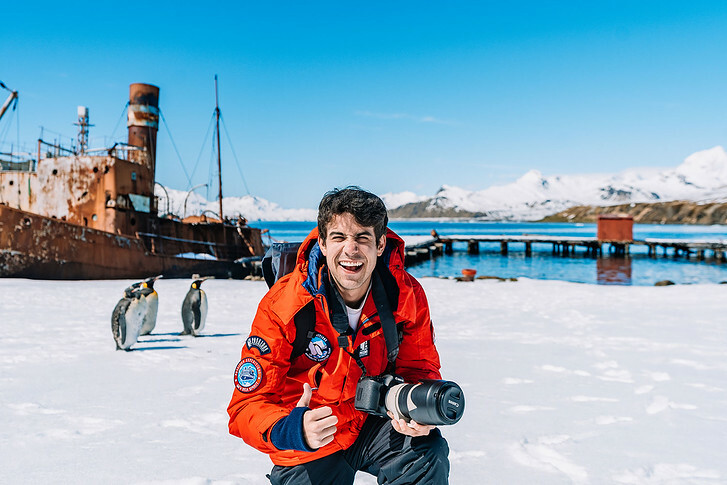 We sailed to the Falkland Islands, South Georgia and Antarctica and along the way were endlessly entertained by penguins, fell in love with zodiac cruising, experimented with vlogging and got our passports stamped for the 7th continent! In total, the cruise was 3 weeks long, plus the extra week in Buenos Aires. I don’t think I’ve ever traveled for quite so long (excluding living abroad) so by the end we were more than a bit homesick. Unfortunately, a national airline strike meant we weren’t going home anytime soon, so we spent a couple days extra in Ushuaia and booked new flights – anything to make it back to New York. 3 flights later and we make it! Only to discover that in our absence, our apartment had a gas leak so the entire building gas line was out for the foreseeable future. I start panicking about how much my rent is going to go up and recuperate over Thanksgiving. December is always the busiest month of the year. We had ambitiously booked travel on top of all our projects, so it was a hectic first few weeks! First, a trip to Paris! Although I had already been everywhere on this itinerary, I decided to go anyway for… “content”. Ha. The funny thing about blogging is you start to make different decisions when it comes to travel, purely so you can use it as material to photograph/write about/etc. We revisited Paris, Rouen, Giverny and Normandy and got a peak at some new towns along the way as well – Les Andelys. I had studied abroad in Paris studying art history so it was nice to see places I had loved as a student. This time things looked a bit different since there were riots all over town and it was winter, so half the things were closed, but it was still fun! 2019 will be the 75th anniversary of D-Day so we spent a lot of time learning about World War II history in Normandy, and I read about 500 wikipedia articles on the subject. Have you ever done that? Start on one Wiki article and end up 5 side topics over by the end of it? All of that World War II history is fascinating to me. Fascinating and sad..
From Paris, I went straight to Los Cabos, Mexico! Well, not directly, I fly back to New York, unpacked, repacked and layovered in Dallas, but you get what I mean. We had a huge summit in Cabo and although I felt like a zombie, the trip was a lot of fun and my final ‘new’ destination of the year. 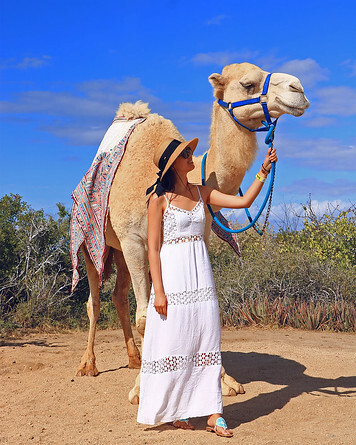 Read more: Sun + Ceviche: The Best Things to Do in Cabo San Lucas! In writing this, I realized I spent the year in a balance of chill times and intense periods, which I think worked out pretty well! I never can really find “balance” so having some months on and some off seems to be working best for me at the moment! I’m hoping to take January + February off from travel to cozy in at home. I mean, I didn’t even spend enough time at home to put up a Christmas tree this year!! I also have a bunch of personal projects I’d like to accomplish. One of which is improving my French. Fortunately netflix has added a bunch of foreign language content and I binge watched a couple already. Highly recommend ‘Call My Agent‘ (dix percent, or 10% in French). How do talent agents only make 10% in France?? Anyway the show is great and season 3 is coming out on netflix in 3 days! If you want to check it out, this episode of Connasse has English subtitles! Anyway, that’s a wrap! How did 2018 look for you?